The French president pledged to rebuild a cathedral that he called "a part of us," and appealed for national and international help to do so. The 12th-century church is home to relics, stained glass and other incalculable works of art and is a leading global tourist attraction, immortalised by Victor Hugo's 1831 novel The Hunchback of Notre Dame. The Paris prosecutor's office said it was treating the fire as an accident, ruling out arson and possible terror-related motives, at least for now. French media quoted the Paris fire brigade as saying the fire was "potentially linked" to a 6 million-euro (US$6.8 million) renovation project on the church's spire and its 500 tons of wood and 250 tons of lead. Despite the dramatic image of the flaming cathedral, no-one was killed. One firefighter was injured, among some 400 who struggled against the flames for hours before finally extinguishing them. Firefighters continued working through the night to cool the building and secure the monument, as residual sparks sprinkled down from the gaping hole where the spire used to be. 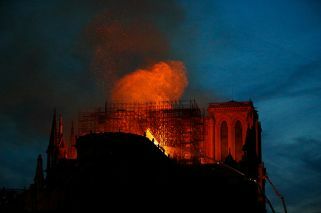 The blaze started at 6.50pm after it had closed to the public, and spread to one of the cathedral's landmark rectangular towers. "Notre Dame of Paris is our history, our literature, our imagination. The place where we survived epidemics, wars, liberation. It has been the epicentre of our lives," Macron said from the scene. "It's not one relic, not one piece of glass — it's the totality," said Barbara Drake Boehm, senior curator at the Metropolitan Museum of Art's medieval Cloisters branch in New York, her voice shaking as she tried to put into words what the cathedral meant. "It's the very soul of Paris, but it's not just for French people. For all humanity, it's one of the great monuments to the best of civilisation."